This story began several days ago, with another pilot on another flight that I wasn't even aware of. On that day, this pilot was flying one of my airplanes. To be clear, let me explain that right now I am only rated to fly the 206 airplane here in Uganda. We also fly one 208 and two 208B aircraft, but because I cannot fly them at this point, I have been, almost exclusively, the pilot to fly the 206 for the past several months. Because of this I have come to think of them as "my" airplanes. I know that they are not "mine", and that the other pilots also fly them, and that they are MAF airplanes, but for the sake of the story I might speak of them as being mine. Moving on... On that day this other pilot was flying MSY, the airplane that I have flown most of my hours here in. Either at some point on that flight, or when he first started up in the morning, the tachometer failed to respond normally. He notified maintenance and the problem was rectified. He finished the flight and went along on his way. The following weekend I fell ill. It wasn't too terribly bad, but after ensuring that the contents of my stomach were no longer in my stomach for a day and a half, I was quite exhausted and not feeling up to much of anything. Sunday brought a small reprieve, and by the time Monday morning rolled around I was a touch tired, but otherwise I felt that I was fit to fly. That afternoon I was scheduled to fly the flight to Bunia (DRC). That flight saw a little of everything, including weather, delays, passengers, cargo, and the stress of trying to get home before my last landing time. I did make it home in time that night, and fell into bed thoroughly tired out that evening. The tinny, incessant beeping of my alarm clock breaks into my consciousness, prying me back into the world of the awake. Slowly, groggilly, painfully, I pull myself out of bed. Every muscle in my body is reminding me that only a couple of days ago they were used rather violently and repeatedly to ensure that my stomach was totally and completely emptied of it's contents. Ugghh. I take a quick assessment of my physical condition. Everything is there and accounted for. Am I feeling sick??? Nope. It's only the physical aches and pains of the sickness that was. Am I fit to fly? After hesitating but a fraction of a second I decide that I am fit to fly and begin to prepare for my day. Shower, had. Flight uniform, on. Cup of tea, brewed. Flight bag, prepared. Everything is ready for my day. I head out the door and up to the office, where I will pick up my flight manifest for the day, any cargo, and then head out for the airfield. My morning preparations went well, and before long I was winging my was northward over the Ugandan jungle. Enjoying the cool air up at 10,000 feet and with no passengers for this leg, I had a quick look at my instruments. Fuel, looking good, amperage normal, temps and pressure good, rpm and manifold pressure right where they were supposed to be. I sat back, pulled a sleeve of cookies out of my flight bag, and enjoyed my less than nutritional breakfast. To be clear, this is not a regular occurrence. A normal in-flight breakfast usually consists of a sesame bar or some such delight. On this day, however, there were cookies in my bag and they were honored to become my breakfast. My first stop on this flight was to be Arua, located up in northern Uganda, and a point of entry and departure for Uganda. 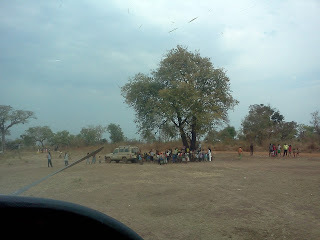 I was headed up to South Sudan on this day, and even though I did not have any passengers the airplane still needed to be checked through immigration. Occasionally I chatted back and forth on the radio with the other MAF pilot in the air that morning, who had been slightly delayed and was about 20 miles behind me. Because he was in the Caravan and I was in the 206, he was catching up but I would arrive at Arua about 3 minutes before he would. We were both headed there because both of us were going into South Sudan and he also needed to clear immigration. 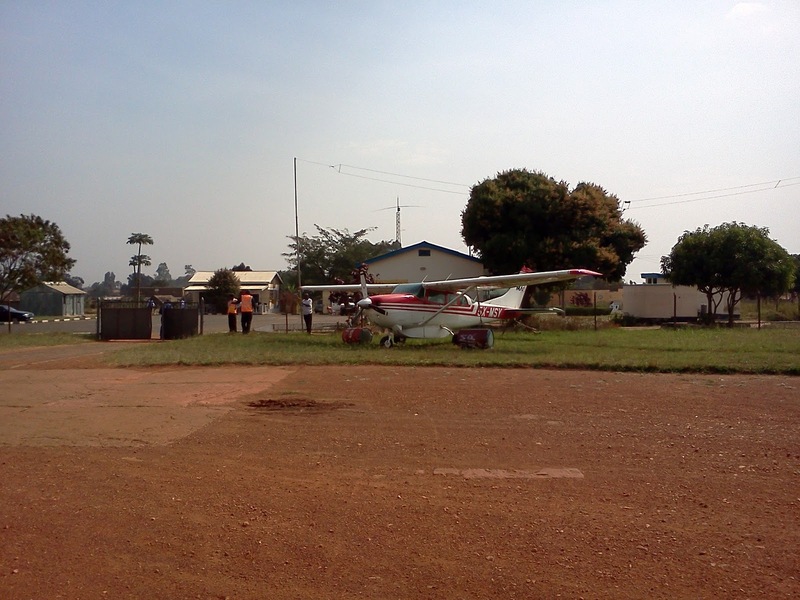 I set the airplane down softly on the red soil runway and taxied up to the parking area. FRM landed shortly after, and a few minutes after that a larger twin engined aircraft also landed and taxied in. Since I was first to arrive and had no passengers to clear through immigration, I was in and out of the office there quite quickly. I hopped back into my plane and started up, thankful to be on my way with minimal delay, and thankful that the man with the rubber stamp was there and waiting for us that morning. My engine started up normally, and my eyes did their normal traveling about the instruments to ensure that everything was normal. The tachometer, which indicates propeller rpm and is a required instrument for flight, was pegged at 0. This was clearly wrong, as I could see through my windshield that the propeller was indeed turning and the engine was running normally. I tried what few things that I could to see if I could somehow coax the needle off the peg and up to normal indications. No luck. I fired up the HF radio and talked to the folks back at the office in Kampala. This was when I learned of the problem that had arisen on the previous flight. I also learned that the pilot of that flight was also the pilot who had just landed behind me, and might be able to help me out once again. I shut down the engine and climbed out. After explaining the problem, we pulled the cowling off and did what little we could to try and remedy the problem. No luck. It may sound like a simple thing, but without a functioning tach, the airplane is grounded. Legally, it cannot fly (nor would I want to fly it without one). I called our ops manager again and we decided that I would tie down the airplane there in Arua, leave it behind and join the other flight so that I would be able to get home for the night. So that's what we did. I battened down the hatches, made sure that everything was in order, and joined flight #2. The rest of the day was tiring, but also fun as I was able to visit with the other pilot as we made our way through South Sudan and back to Kampala. I fell into bad that night once again exhausted and ready for a good night's sleep. When I think of the day, there are so many things that went right. I was not in flight when the gauge failed (I would have been able to finish the flight and land safely, but it's nicer when things are working properly). We were still in Uganda, and not in a remote location in South Sudan when it happened. The other airplane was there and able to take this stranded pilot with it. MAF Juba was able to do an extra flight and carry the passengers that I was to have picked up, and everybody still got where they needed to go. The AIM Air plane that is normally tied down there in Arua is gone for a few weeks and I was able to use his nice tie downs. There's more, but you get the point. Once again, I thank you for your prayers and support. We couldn't be here without them. Tomorrow (Thursday) we're headed back up with two mechanics and two pilots (myself and one other) to fix the problem. The plane that we are taking from Kajjansi will continue from Arua up to South Sudan for the rest of the day's flying, and the mechanics and remaining pilot will fix the problem and bring the plane back home. Thanks for sharing, Dallas. God is good. Always the day your not feeling 100% that something goes wrong. Glad you made it home safe buddy!